PSA and USIP offered Congressional staff a chance to speak with on-the-ground conflict resolution professionals in countries such as Afghanistan, Libya, Iraq, Burma, Israel/Palestine, the Sudans, and more. USIP experts have extensive on-the-ground experience and academic training to provide a rare quality of expertise which is effective in strategic and cost-saving techniques to bring stability to violent prone areas as well as advancing American values and interests. In the spirit of Congressional recess, this was an informal event with an opportunity to learn from and talk with USIP peacebuilding experts. 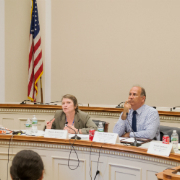 This was be the seventh event of the PSA/USIP Congressional Briefing Series – topics on International Conflict Resolution and Prevention, an educational program designed to provide congressional staff opportunities to engage with leading experts and fellow Capitol Hill staffers in bipartisan forums. The program aims to build cross-party relationships, encourage bipartisan dialogue, and equip staff with new perspectives on critical issues in the international conflict resolution and prevention field. Lucy Kurtzer-Ellenbogen is a senior program officer in the Center for Conflict Management, where she coordinates the Institute’s work on the Arab-Israeli conflict. In addition, she co-chairs the joint USIP-Stimson Center Lebanon Working Group. Prior to joining the Institute, Kurtzer-Ellenbogen consulted on Arabic media discourse and worked with the U.S. Department of State as an Arabic language specialist, focusing on bilateral treaties and agreements. Previously, as a program officer at the Kennedy School of Government’s Middle East Initiative, she worked on the Israeli, Palestinian, and Saudi Arabian portfolios. Kurtzer-Ellenbogen’s professional and academic career has taken her throughout the Middle East, with considerable time spent in Egypt, Israel, the Palestinian Territories, and Yemen. Her graduate research focused on the Arabic language press in Israel, and the Arab citizens of the country. She holds a bachelor’s degree in Arabic and French from Georgetown University, and a master’s degree from Georgetown’s Arabic department with a dual concentration in Arabic linguistics and Arab studies. What they’re working on: USIP’s work on the Arab-Israeli conflict has long focused on the complementary processes of official and non-official diplomacy and peacemaking. In the context of the newly re-launched talks between Israeli and Palestinian negotiators, USIP efforts range from advising the Quartet Representative and the parties, to assisting and supporting grassroots dialogue on core issues that engage stakeholders from across the Israeli and Palestinian political and ideological spectrum. Colette Rausch is the director of the Institute’s Rule of Law Center of Innovation. Her focus is on criminal justice and police reform initiatives that have included missions and projects in Afghanistan, Guatemala, Kosovo, Liberia, Nicaragua, Peru, Nepal, Burma, Libya, Iraq, and Yemen. Prior to joining the Institute, Colette Rausch was director of the Rule of Law and Human Rights Department with the Organization for Security and Co-operation in Europe’s (OSCE) Mission in Kosovo. Other past posts have included serving as a federal public defender; overseeing the U.S. Justice Department’s justice sector training and development operations in the Balkans, as well as acting as the resident legal adviser in Bosnia. She has also served as a federal prosecutor focusing on white collar crimes, and created and directed the consumer fraud unit of the Nevada Attorney General’s Office. What they’re working on: The Rule of Law Center is currently working in Libya in conjunction with various Government Ministries to provide strategic planning assistance, an organized crime threat assessment, a prison assessment and monitoring tool, and an analysis of the justice and security sector, including bringing together key stakeholders for justice and security dialogues. In addition, the Center has provided civil society and government stakeholders with workshops on the rule of law, trauma resilience, and post-conflict justice in Islam. The Rule of Law Center continues to provide similar tools, analysis, and assistance in Yemen, Afghanistan, Burma, South Sudan, Nepal, and Iraq. From 2008 to 2010, Rusty Barber was USIP’s director of Iraq Programs. Prior, he served as chief of party for USIP’s mission in Baghdad from 2007 to 2008 where, he managed a staff of Iraqi specialists responsible for implementation and oversight of the Institute’s projects and grant programming in Iraq. Before joining the Institute in March 2007, Barber served as a political officer in the Foreign Service, holding posts in Central and South Asia and Europe. As a member of the U.S. delegation to the Organization for Security and Cooperation in Europe, he was responsible for Central Asia and national minorities policies. In that capacity, Barber helped lead the organization’s response to political instability in Kyrgyzstan in 2005. From 2003 to 2004, he served in Pakistan, overseeing the embassy’s evaluation of Pakistan’s counterterrorism efforts. What they’re working on: Rusty Barber is currently reviewing USIP overseas operations in regions of conflict and instability, including Afghanistan, Iraq, Libya, Syria, Pakistan, Sudan, Nepal and the West Bank. Results will support the Institute’s strategic goal to expand its global reach and impact. Andrew Wilder joined USIP in August 2010 as the director of Afghanistan and Pakistan Programs. This past May, he testified before the Senate Foreign Relations Subcommittee on Near Eastern and South and Central Asian Affairs emphasizing the critical importance of the 2014 elections in Afghanistan. Prior to joining the Institute, he served as research director for politics and policy at the Feinstein International Center at Tufts University. Previously, Wilder served as founder and director of Afghanistan’s first independent policy research institution, the Kabul-based Afghanistan Research and Evaluation Unit (AREU). This was preceded by more than 10 years managing humanitarian and development programs in Pakistan and Afghanistan, including with Save the Children, International Rescue Committee, and Mercy Corps International. What they’re working on: In the lead up to the 2014 transition period in Afghanistan, the Afghanistan Program regularly hosts high-level and mid-level meetings in Washington, D.C. that focus on the importance of the political transition next year. The Pakistan Program sponsors a Peace Innovations Fund (PIF) which supports small-scale innovative pilot projects working on the ground in Pakistan to promote peace through the arts, youth engagement, and community dialogue. The Afghanistan and Pakistan Programs work in-country to promote peace and stability through programs designed to improve understanding of peaceful dispute resolution, advance peace education in schools and communities, enhance dialogue between local and international communities, and promote the rule of law.